An attic is usually un-finished, and in particular - does not have a proper finished floor. The only place to walk is along the beams so one does not go crashing down into the room below. 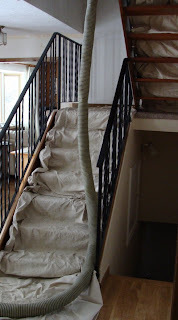 Most commonly, the only way to reach an attic is via a retractable ladder or by standing on a chair to heist oneself through an opening in the ceiling. A loft, on the other hand, can be an open space with a balcony, above the room. It usually has a staircase to reach it. Or, a loft is sometimes a converted attic. "Converted" meaning that it has finished flooring and walls, etc. and is decorated as a living space, commonly for sleeping. Thanks Janey, for that very clear explanation of the difference between loft and attic over here! I thought it must be something like that.